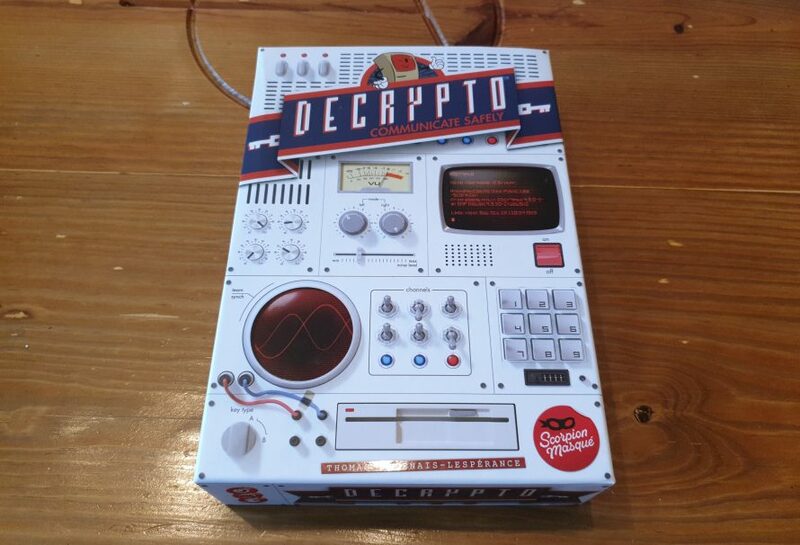 Decrypto is a word based party game, released in 2018 by publisher Le Scorpion Masqué. 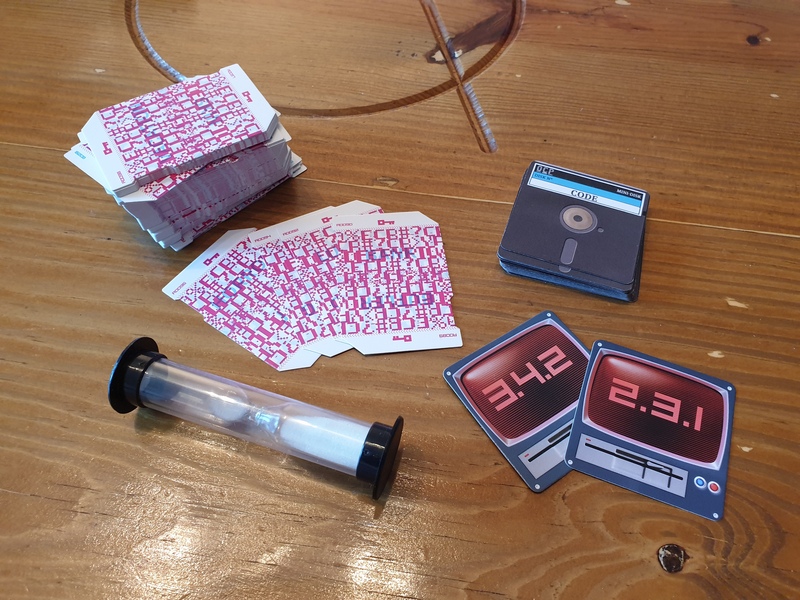 Designed by Thomas Dagenais-Lespérance, the game sees 3 – 8 players split into two teams, attempting to send and intercept codes. Lasting around 15 – 30 minutes clue words will be given, codes cracked and vagueness ramped up. However, is this a game that can take on the dominance of Codenames? Let’s find out! Setup is extremely fast. Players split as evenly as possible into two teams, with each team taking one of the two screens and associated, identical, code decks. Each team then draws 4 word cards and slots them into their screen – in red windows labelled 1 to 4. Teams then get a notepad and a pen/pencil, the sandtimer is placed within reach and the game is ready to play. 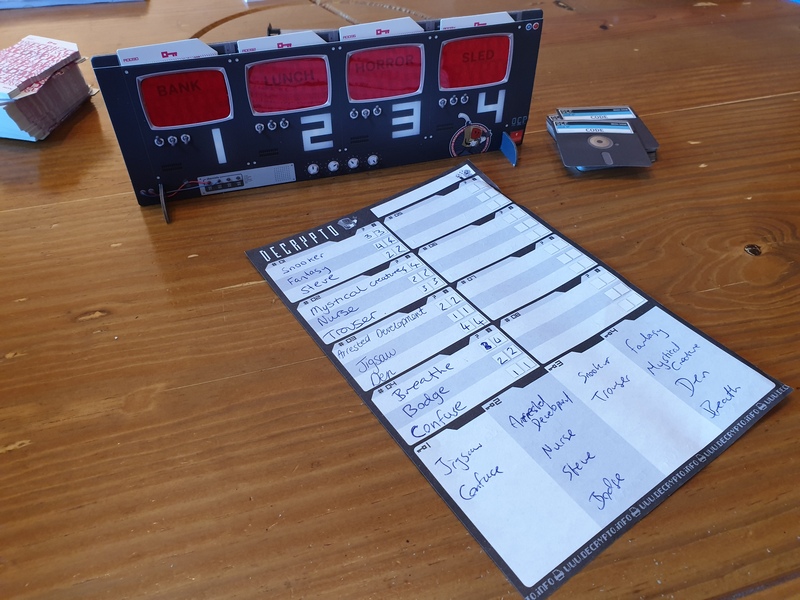 Each round one member of the two teams becomes a clue giver, whom shuffles their team’s code deck before drawing a code card. This card is kept secret from every other player, not just the opposing team. These code cards have a 3 digit code that you can hint to via the 1 to 4 labelled words in your team’s screen. After a brief period of time the clue givers write down on their teams sheet 3 clues. Once finished they turn the sandtimer over, giving the other team’s clue giver limited time to finish their clues. Starting with one team, the clue giver reads the 3 clues aloud, each hinting towards a different number. A real life example of this, we had (1) Thunderstorm, (2) Army, (3) Texas and (4) Leprechaun. The code I had to send to my teammates was 3-2-1, so I said rather too obviously was South, Gun and Clouds. Whilst a brilliant example of giving the information to my team, it was also very helpful for our opponents. Why is this important? 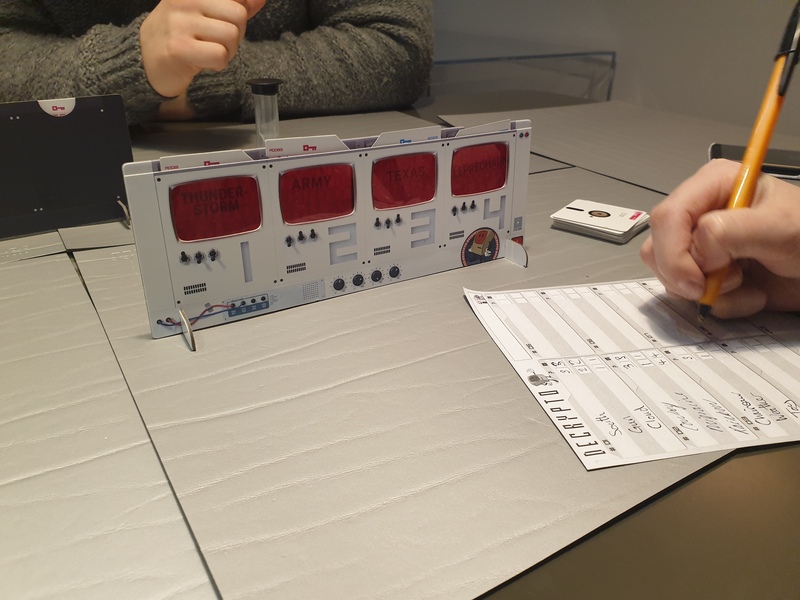 In the first round only your team gets to guess the code, with failing to do so gaining a black mark miscommunication token. In future rounds, on top of your team guessing, the opposing team will try to intercept the code. By linking the words from previous rounds, with the codes they were used with, the other team tries to correctly intercept a code to gain a white interception token. Note, correctly guessing your teams code or incorrectly guessing the other team’s code does nothing. This allows teams to attempt an interception risk free. Although rounds see one team guess or intercept first, a round can be seen as being done simultaneously. Therefore, it is only after a round that results are considered. The game continues until either team has correctly intercepted or miscommunicated twice. Unsurprisingly, intercepting twice sees your team declared the winner, while incorrectly guessing twice loses you the game. It is possible that both teams reach this stage at the same time, or one team fulfils both criteria at the same time. Also, the game has a maximum of 8 rounds. If any of these events occur, including all round being played out, a tie breaker is triggered. First, interception tokens are worth a point, whilst miscommunication tokens are worth -1. If teams are still even correctly guessing the other team’s actual clue words splits the teams. It is worth only briefly mentioning these tiebreaker situations when explaining, as they rarely occur and slow down the game getting to the table. From experience, mention them briefly so players do not feel aggrieved if they occur but gloss over them swiftly. Components wise Decrypto is mostly strong all around, with the screens really lifting the title. Not only do these screens work perfectly for holding the word cards, they are also great for hiding any notes you take down throughout the game. So, no one can see the words beforehand, and accidentally cheat, the word cards visibly look like a jumble. This is until they are poked into the screen and the red plastic shows you only the word, similar to looking through the red half of a pair of old 3D glasses. Not only does this get around a potential problem it also adds to the code cracking theme. Decrypto isn’t perfect though, as the tokens for failing to guess and interceptions match the team colours, which is an oversight big enough to confuse some new players. The box states the game is playable for 3 – 8 players, and there are 3 player rules included. However, Decrypto is a team based game. As a result, it works best with 4+ players and more so with even numbers. In reality the player counts to play with are 4, 6 or 8, unless one team is happy to have a disadvantage – not that game is automatically unbalanced if the teams are uneven. At four the game is more than playable but, as with many similar team games, splitting the pressure of determining what an answer is among a couple of teammates feels better. Though each player will get less turns as the clue giver – so there is a trade off. The brilliance of Decrypto is that your team can see the words you are hinting towards. This means that you can be vague and they will have a reference to go on. The fact they know the words also means that the clue giver can rotate between members of a team, so one player isn’t sidelined to only give clues for the entire game. Make an stretching clue, which your team will only just be able to link, can potentially leave the deductions of the other team to become a muddle. Teams should aim to do this as when you throw the other team completely, and they start to doubt themselves, the victory becomes easier to grasp! The game does its best to structure the fun but not in a negative way. Whilst in-jokes and references are frowned upon, it is for the best. With the opposing team able to make guesses from the very clues your team is giving, it causes people to get creative! This also balances the game when a couple or friends team up, whom could have their own references, which no one else will guess. It’s fine if everyone is in on something but in Decrypto it would be painful to spend the game completely out of the loop. Decrypto creates the same style of enjoyment that Codenames offers and has many of the same vibes. Yet, Decrypto seems to engage players that bit more than Codenames, however it isn’t as simple to explain. It is far from a hard game to play or teach however there are some niggles with the rulebook and some have struggled to picture how the intercepting of clues works until playing. Start playing and players instantly get the game and will want to play over and over again – with the fun flowing naturally. Unlike a lot of clue giving games the task here is to be vague and not go for the best, most obvious, clues. It might not always be easy to guess what words the other team have. However, one thing is obvious… Decrypto will continue to hit the table with family and friends alike!